A friend recently reached out to ask if we’d help her makeover her tile table using our recent staircase makeover as inspiration. The good news was, ANYTHING we did to it would be better than the boring, dated, lifeless state is was currently in! Our friend chose what stencils she wanted as well as the colors, then we got to work. First, we mixed each color of paint with BB Frösch Chalk Paint Powder to make chalk paint that would easily bond with the tile. We also used white paint and navy paint that we had on hand from the floor makeover. Next, we cleaned the table with Pine-sol and taped of the edge of the tile insert. If the original tile had already been white, we would have just began stenciling, but the brown tile had to go, so we first painted the entire tile insert white. Although we used a brush, this step could easily be done with a roller. Paint the first coat thin—it’s a bonding coat that gives the second coat something to stick to. A thick first coat will not only take longer to dry and cure, it will be harder for the second coat to level into, which makes it harder to achieve a nice, smooth finish. Allow the first coat to fully dry AND cure. Drying takes only minutes, but curing could take up to 24 hours. When painting the second coat, DON’T OVERWORK YOUR BRUSH! Because a second coat introduces moisture, the first coat could more easily lift, especially if you over-work your brush. If the first coat does happen to lift a little, stop there, allow the area to dry, smooth with sandpaper, then try again. After two coats of white, the tile was ready to stencil. We used various left-over stencils from previous projects and alternated the colors for a completely random pattern. Blaire even helped! Isn't it awesome that chalk painting is something everyone can get involved in? For tips on avoiding bleed when stenciling check out these stenciling posts: chalk painted linoleum floor, chalk-painted tile tutorial. Once all the tiles were stenciled, the rest of the table was painted navy, and the whole table was sealed with the same water-based poly we used for the floor project and the stair project. We have a TON of this stuff, so you can expect to see it on future projects! Although the skirt and legs could have easily been waxed for a softer appearance, it was easiest to just seal the whole table at once. If you don't love super shiny, just select a matte poly instead of a glossy one. The key is making sure whatever poly you use is water-based. I don’t recommend sealing painted tile with wax. Poly is a little more challenging to apply, but it holds up better on tile. 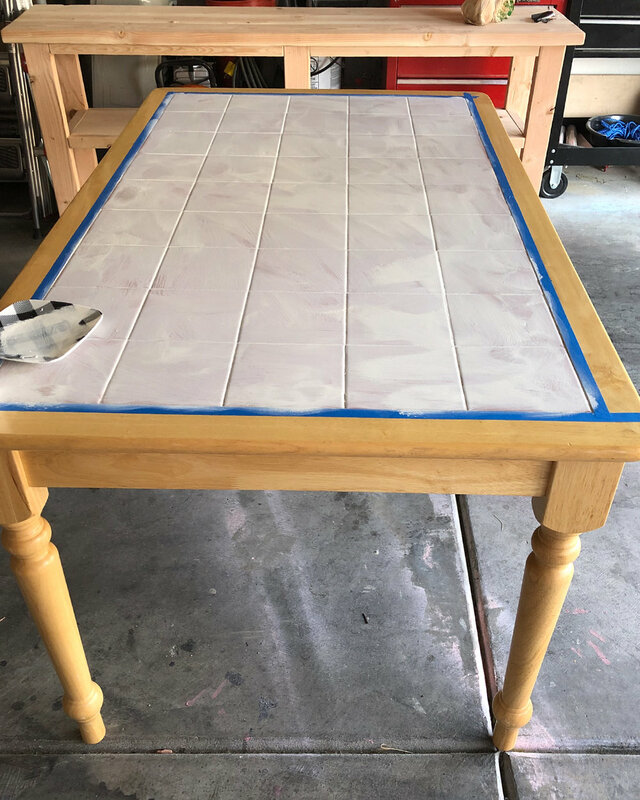 I can't say I'd be on the hunt for a table with a tile insert just to do a project like this, but if you find one for cheap at a thrift store, or you've been handed one down from Grandma, this update solution is a WIN!